An international team of scientists recently published groundbreaking research indicating quantum computers aren’t handicapped by a classical view of time. Grab a cup of coffee, we’ll explain. The researchers set out to determine if quantum computers could be used to overcome one of classical computing’s biggest problems: causal asymmetry. When you watch events unfold, for example, the computer in your head (some folks call it the human brain) starts predicting what’s going to happen next. So if you’re watching a video where an action sequence plays out, you can follow along and make sense of it all. The same sequence, played backwards, usually doesn’t make any sense – this is why time, as far as physics predictions are concerned, doesn’t work the same way when you reverse it. Some scientists believe in a concept called the arrow of time, basically insinuating that time is a one-way street and reversing it would change the nature of cause and effect — this has to do with entropy, but we won’t get into that here. 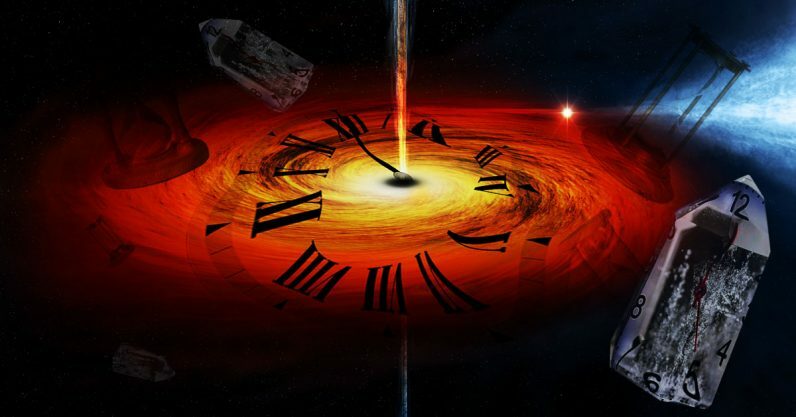 However, the arrow of time theory doesn’t appear to extend into quantum physics – which are wacky and weird by nature. Imagine a movie scene where a car drives off of a cliff, plummets downward, and finally explodes when it impacts with the ground below. That makes perfect sense, even viewed through our limited understanding of physics. The same idea can be applied to our understanding of the real world. If you’re a professional goalkeeper, chances are you’re pretty good at predicting where a football traveling at high-velocity is heading before it gets there. Your brain uses observational information on the ball’s velocity and trajectory to predict where it’s going to end up. In this case, we can also use the same information to make predictions even if we reverse the arrow of time. When it comes to a single ball moving along a predictable path, causality works about the same in both directions. It’s even easier to understand if you imagine dropping a football from a roof. If you were to see an image of a ball halfway between the ground and the roof of a building, you could easily predict which way it will travel in forward or reverse time – either up or down. But what if we’re not talking about straight lines and single trajectory arcs? What if we toss a handful of glitter up in the air and freeze the frame when the majority of flakes are at their apex? You could, theoretically, run a classical simulation to determine where each would land going forward, but doing the same thing backward would be exponentially more difficult and require a much more powerful computer processor. That’s why the aforementioned researchers set out to find out if quantum computers handled the arrow of time differently. Theoretically, since quantum computers don’t subscribe to our version of physics, it’s possible that they wouldn’t have the same problem with causal asymmetry that humans and regular computers have. And it turns out they don’t, at least according to the research published by the team. They ran physics predictions across classical and quantum systems to determine how much overhead, or memory, the calculations took up when processed forward and backward. In classical systems, causal asymmetry was confirmed, as the reverse predictions were far more resource intensive to run. But when the experiments were run on a quantum computing system, the direction of the arrow of time didn’t matter. Quantum computers are almost equally as adept at inferring effect from cause as they are cause from effect. The most exciting thing for us is the possible connection with the arrow of time. If causal asymmetry is only found in classical models, it suggests our perception of cause and effect, and thus time, can emerge from enforcing a classical explanation on events in a fundamentally quantum world. In other words, according to the research, our entire idea of time is based on a very narrow-minded view of how things actually work. The universe, it turns out, might be pretty ambiguous when it comes to Newton’s Laws of Motion.